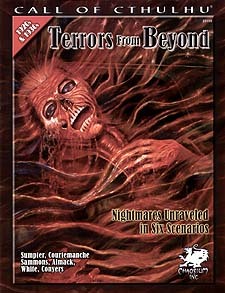 TERRORS FROM BEYOND is a collection of 1920's and 30's adventures for Call of Cthulhu, designed for play with pre-generated characters. The book provides fine opportunities for an impromptu game or tournament play and - because the characters are intimately connected with the plot - roleplaying challenges not normally available in most published material. An excellent adventure collection for new and veteran Call of Cthulhu players alike. GHOST LIGHT: The keepers of a remote Scottish lighthouse have vanished. What fate awaits those who come to investigate the disappearances? GRAVE SECRETS: The people of Stafford, Rhode Island, live much the same as their colonial forbears, making only gradual concessions to the encroaching tread of progress. Now, a fate both formless and awful has befallen a family in town. One by one, the children succumb to a newly arrived yet ancient, menace. THE DIG: Miskatonic University students on an excavation at nearby Dunlow Woods uncover ancient secrets, murder and horrors from the past. A METHOD TO MADNESS: The investigators have been committed to a private asylum. Are they really insane? Is their impending cure now worse than their derangements? DEATH BY MISADVENTURE: Evidence suggests that Charles Stanhope was killed by the accidental discharge of a faulty shotgun at his home in the Lincolnshire Fens. The Coroner's verdict is death by misadventure - but is there a suggestion of something far more sinister? THE BURNING STARS: The investigators recover in a US Military hospital in Haiti suffering from on-going and prolonged blackouts. The last seven days of their lives have vanished from their minds - is it amnesia, or a fear of remembering?